One clear sign that you’ve walked into a Starbucks Community Store is that the register barista is wearing a special Community Store green apron! A Starbucks Community Store is a special Starbucks that is partnered with an area non-profit to share the store’s profits with that non-profit organization. Currently there are community stores in Harlem, Los Angeles, Seattle, Lakewood (Tacoma, Washington), Houston, and San Antonio. Starbucks has been quoted many times as saying that they intend to operate 50 of these stores by the year 2018. 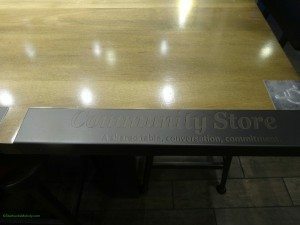 Up until now, I think it’s possible that a customer could walk into a Community Store Starbucks, and not notice that that he or she is in a very special store. This is because many Starbucks customers walk in, make a beeline for the register, grab their beverage and go. There has always been visual clues in store design that tell a customer he or she is in a Community Store, but if you head straight for the register, it could be easy to miss! 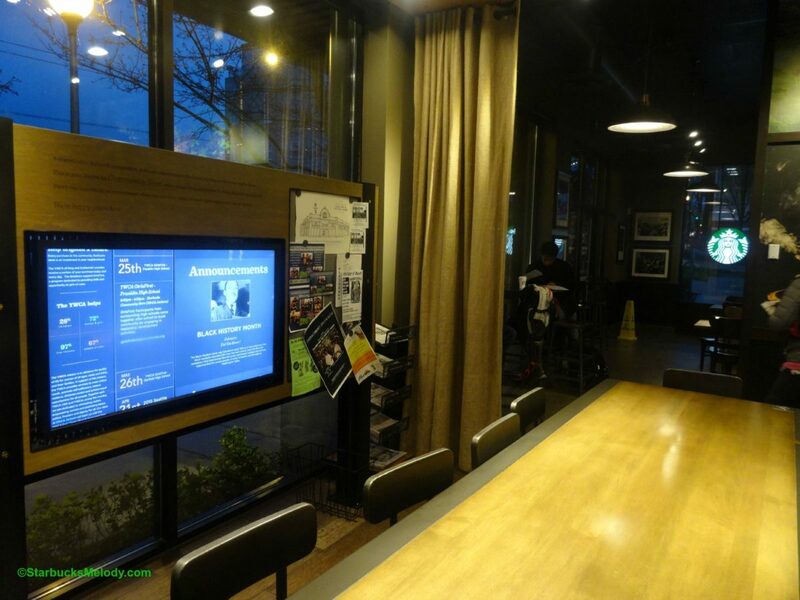 I dropped by the 23rd and Jackson Starbucks yesterday. This store is partnered with the YWCA, by donating fifteen cents per transaction to the YWCA. And lo and behold, while in this Starbucks, I noticed the partners wearing special green aprons. I think this is a fabulous idea! Also the store has added more information about the partnership via a monitor near the front window. And kudos to the partners for being very friendly and willing to show off their aprons! 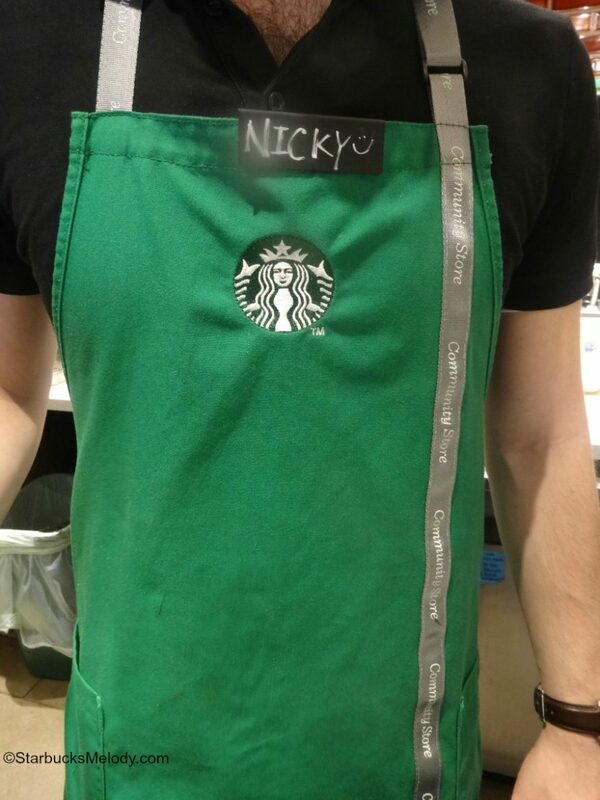 Nobody in the store recognized me (that I know of – the register barista asked for my name for the cup and Nicky asked what the pictures were for), yet I had no problem talking with the partners about their store and taking a few photos. That is exactly how it should be! If you find yourself in a Starbucks with baristas wearing these special green aprons, you know a portion of your transaction is going to a non-profit! Celebrate the Frappuccino's 20th: Try the Birthday Day Cake Frappuccino March 26th - March 30th. I remember discussion of this. So automatically a portion of your purchase goes to the nonprofit? How does the store decide what nonprofit to support? I wish SB would expand on this idea in some way. Perhaps the month of April when they dedicate that to community service they should have all stores donate a percentage of their profits to a nonprofit? My only minor concern is that there are so many needy nonprofits and as an individual customer what if I do not support or believe in that cause? @Purple 1 – I have some difficulty imagining anyone getting upset that a portion of their transaction is going to a non-profit. Starbucks isn’t going to change this model. 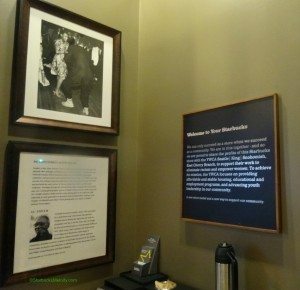 Starbucks picks non-profits based upon how they want to support certain initiatives – for example the community stores near military bases have money that go to things like GoodJobs – A goodwill program for veterans. If a customer really finds the non-profit pairing to be repugnant to him or her, then he or she can not go to that Starbucks. Melody I like the idea of a portion of the sale going to a nonprofit and there certainly are so many wonderful groups out there. But, on some level I sort of feel that some customers would not want to feel they are given no choice in their nonprofit. Also, you are right that a customer does not have to go to that SB store. Making a donation can be a very selective and personal decision. I personally like the idea! SB might be making me aware of an organization in need tat I didn’t know about before I went into one of their community stores. Nice!